Together Always log cabin is perfect for a relaxing getaway or a romantic honeymoon cabin in beautiful Gatlinburg, Tennessee. Come and experience our updated bonded leather furniture, internet and flat screen TV's. Nestled under a canopy of cool evergreens in a private setting awaits "Together Always". As you enter Together Always log cabin, you will find a spacious kitchen and dining area. The stone wood burning fireplace is the focal point of your comfy living room; great for snuggling on those cold winter evenings. Retreat to the master bedroom with king bed and jacuzzi bath and create your own Together Always moments in time. Engage in a heated game of table top bumper pool or poker. Enjoy a bubbly hot tub from your private deck overlooking a wooded view. Together Always log cabin is a few minutes from the Gatlinburg Trolley; It's an economical way to see the Arts and Crafts Community, The Great Smoky Mountains National Park , downtown Gatlinburg and even Dollywood in Pigeon Forge!!. The Gatlinburg Trolley is one of the best bargains you'll find in the Smokies with rates starting at fifty cents. Park your car, save gas and enjoy the scenery from the Gatlinburg Trolley. Together Always log cabin is located close to many attractions and activities including the *Gatlinburg Community Center which offers an indoor swimming pool, basketball/racquet ball court (ping pong and billiards), fitness center, bowling center and much more! . 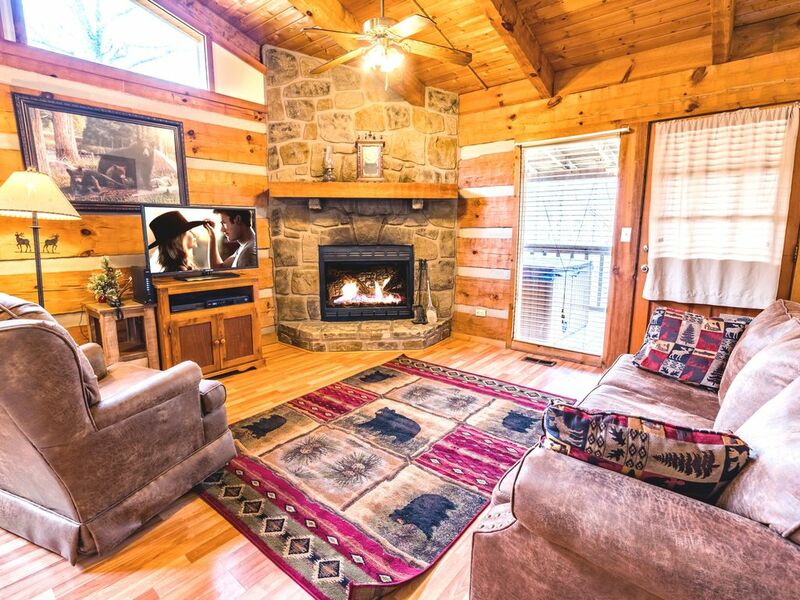 Relax; your Smoky Mountain Vacation will be a special one when you stay in Together Always Log Cabin! When you're with someone special, you're never alone! "Together Always" is an adorable log cabin located near the Gatlinburg Arts & Craft community and minutes from the downtown Parkway. Located all on one level and featuring a wood burning fireplace, indoor jetted tub, fireplace, fully equipped kitchen, covered rear deck with rocking chairs, forest view and an outdoor hot tub. All of this for a great price! Reserve your mountain getaway today! This cabin is nestled in the Gatlinburg Arts and Crafts community, about 10 to 15 minutes from downtown Gatlinburg. It is located just minutes from the major attractions, shopping and dining. It is located away from the hustle and bustle, but not too far out. We want to thank you for choosing TNT Cabin Rentals! We have some of the most secluded log cabins in the Gatlinburg and Pigeon Forge area that you will find, but they are all conveniently located within a short drive to all of the area attractions that you will want to see while you are staying in your Smoky Mountain cabins. Make sure you take your time and look at all of the different cabins we have available so you get the perfect one for you and your family, or maybe just you and your significant other. This cabin was in the perfect spot. A short drive to downtown Gatlinburg, the national park. The cabin is in a quiet area up on a hill and is situated for privacy even though anouther cabin is only about fifty feet away. The hot tub on the back deck is perfect and the temp stayed consistent all three nights. The only negative we found was the housekeeping could be better. There was lots of hair and debris built up behind to bathroom door, cobwebs and found a sock under the bed. But honestly that did not interfere with our weekend. We enjoyed honeymooning in this cabin. It was very romantic and perfect for our quality time together. We loved how close it was to Gatlinburg (roughly 10 minutes away). My only complaint is that it could have been a little cleaner... I had to re-wash some dishes. We can’t wait to come back and visit!!! We enjoyed our stay. The only complaint we had was the bed. The cabin was beautiful peaceful and quiet. I loved it but it could have used a little bit more cleaning for me. The cabin was beautiful had everything we needed. Our trip to Gatlinburg was great. Our cabin was beautiful. I loved the area the cabin was located. If I had to change anything it would be higher temp for the hot tub and the parking. But we will be back this summer and hope to rent from you again. We loved sitting in the hot tub and watching it snow. We will be back. This cabin is nestled in the Gatlinburg Arts and Crafts community, about 10 to 15 minutes from downtown Gatlinburg. It is located just minutes from the major attractions, shopping and dining. It is located away from the hustle and bustle, but not too far out.